As any devout Renegade Gardener knows, the nursery industry can’t leave anything well enough alone, and since Heuchera have fast become the latest “it” perennials in the gardening world, they’ve decided to make these stellar, although fairly diminutive foliage plants…smaller. I get it, I guess. For gardeners looking to scale things down, perhaps create little patches in the semi-shady landscape that demand a closer look, the new miniatures will be helpful. Just keep in mind they are tiny, typically growing 5-6” tall by 9-10” wide with a height in flower of 9-10”. Faery garden aficionados will certainly approve! The tiny balls of bloom that emerge early to midsummer range from white to pink to red, depending on cultivar. 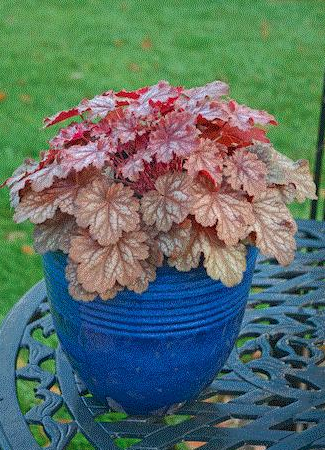 In addition to the uses above, the new miniature Heucheras are certainly a wonderful addition to containers, particularly smaller containers and bowls of any size. In the garden, Heuchera prefer part sun (try to avoid full sun exposure in early to mid-afternoon, unless you keep the soil moist) and any decent soil that drains pretty well. 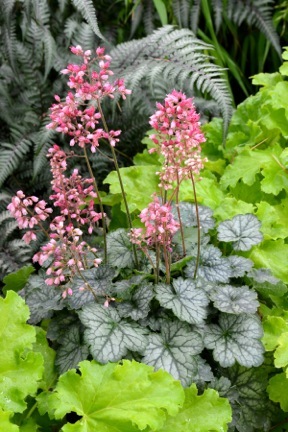 Most Heuchera are hardy to zone 4 and can even survive zone 3 if mulched for winter and fertilized, religiously, in spring. Once again, the fine plant purveyor Terra Nova Nurseries of Oregon is leading the way—look for their Little Cuties™ series, which includes ‘Peppermint’ pictured here.